A two-day course aimed at familiarizing participants with the basis and application of various omics disciplines: genomics, transcriptomics, metabolomics, proteomics, and bioinformatics. 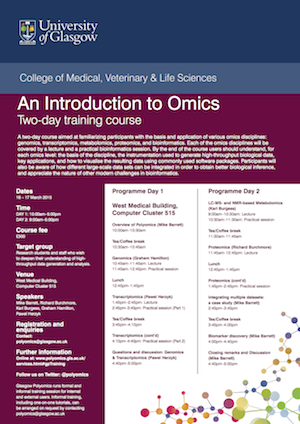 Each of the omics disciplines will be covered by a lecture and a practical bioinformatics session. By the end of the course users should understand, for each omics level: the basis of the discipline, the instrumentation used to generate high-throughput biological data, key applications, and how to visualize the resulting data using commonly used software packages. Participants will also be aware of how different large-scale data sets can be integrated in order to obtain better biological inference, and appreciate the nature of other modern challenges in bioinformatics. Research students and staff who wish to deepen their understanding of highthroughput data generation and analysis. To register, please contact us via our enquiry form using a University of Glasgow email address and state the date of the course you would like to attend. All enquiries should be directed to Rachael Munro.